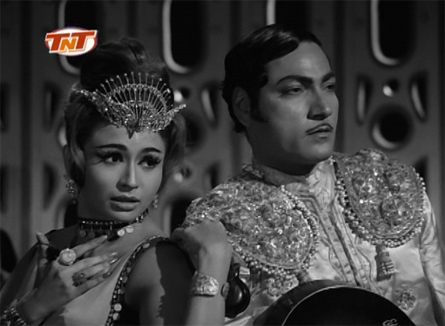 Rita (Mumtaz) is the daughter of an archaeologist (Prithviraj Kapoor) who is excavating an ancient site. She is engaged to marry Suraj (Biswajeet), an artist, and the son of her father’s best friend. Rita’s father has been managing Suraj’s large inheritance since Suraj’s father died, and will hand it all over when they get married. At the excavation site, the workers unearth an ornately decorated room with a life-size statue of a dancer as its centerpiece. There is also a skeleton wearing bangles that exactly match the statue’s. Prithviraj (I don’t think he had an actual name in the film) takes the bangles for safekeeping. Rita is obviously pleased to be marrying Suraj, but he seems a little more ambivalent. So when he hears the haunting strains of a song (the beautiful “Har Tukda Mere Dil Ka”) and follows the sound to its source, there is clearly trouble for Rita ahead. 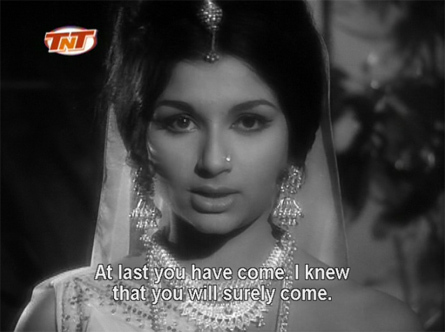 The mysterious beauty (Sharmila Tagore) tells Suraj that she’s been waiting for him, and seems to expect that he knows her too. She says her name is Kiran. Over the next few days, she continues to appear in front of him, only to vanish suddenly, and he becomes obsessed. Her allusions to their past together still make no sense to him, but he can’t stop thinking about her. The story is interrupted at random for a Helen flamenco song—“Huzoor-e-Wala”— not that I’m complaining. Suraj hosts a party to which he invites Kiran. Rita is upset, and her father even more so. Kiran shows up dressed exactly like the antique statue, even wearing the same jewels right down to the bangles! Prithviraj discovers that the bangles he had locked up are missing, and the next day the statue at the site is gone as well. He and his assistant Rakesh investigate the history of the site further, and Rakesh finds a reference to a dancer who was murdered there 2000 years before because of her love affair with a sculptor. On the pretext of painting her portrait, Suraj continues to meet Kiran and finally acknowledges to her that he loves her. Prithviraj and Rakesh are gradually convinced that she is the reincarnation of Kiranmai. Rakesh takes some photos of Kiran with Suraj but when the photos are developed, only Suraj is there. 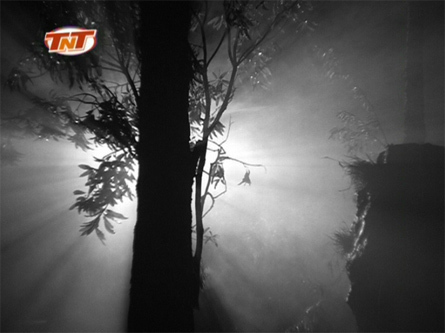 After Suraj spends the night in a cave with her, Prithviraj confronts him. If he doesn’t marry Rita, he will lose his inheritance per his father’s wishes. 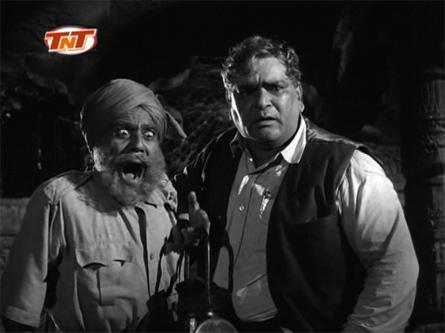 Suraj stubbornly declares that he has no interest in his inheritance. Rita’s patent anguish at his betrayal fails to move him either. At the temple site under a full moon, Kiran finally tells Suraj that she is not a human being, but the ghost of Kiranmai. They were lovers in a former life and if he wants to be united with her forever, he will have to kill himself on this very night. Can he do it? Will he do it? I think the main reason that I felt neutral about this film rather than really liking it is Biswajeet. He is handsome, but very aloof and restrained. For me, the role really required someone with some passion and fire to make the love story work. 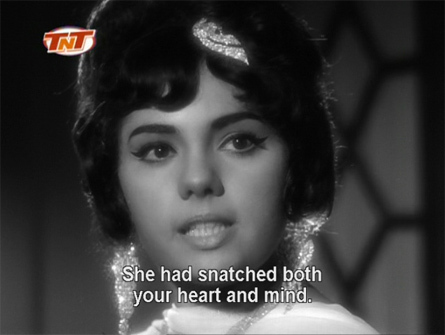 Also Sharmila as Kiran was not very likable and I’m always partial to Mumtaz anyway, so I had trouble rooting for her as the heroine. 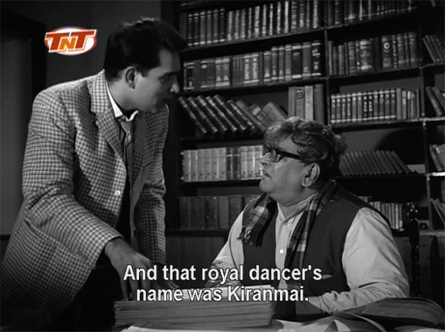 The biggest plus (besides the music) was Prithviraj Kapoor—it is the most substantial role I’ve seen him in (including Mughal-e-Azam) and it was a joy to see him on screen so much. Posted on February 6, 2008 at 11:45 am in Hindi movies	| RSS feed You can skip to the end and leave a reply. Biswajeet’s movies are gifted with fineness in music, songs, visual arts overall. even today viewers prefer to hangup for these. unfortunately these movies are obliterated and needs proper marketing channel to appear once again on the screen. if any company like shemaroo, moserbear etc., can take initiate consumers will be highly satisfied. it is needed to understand that there are costomers even today for these movies. I fully agree with you. Why we don’t see these movies on channels these days? Heh :-) Sharmila is very beautiful, but I find her too cold generally. Like Aishwarya. And there was no chemistry between Biswajeet and her whatsoever in this. One of them needed to add a little fire to the relationship, but neither did. I’d like to see Biswajeet in more films though, in the right role I think he’d be great. Hi I wud love to see this movie. Can u please tell me on which site can i watch it online or if not where can i get the dvd? These movies are not accepted in the market because of the evolution taken in the minds, intellect of the present generation compare to theose of 1960’s. But when it is contemplated on music, songs, lyrics, presentation of biswajeet and other co stars at individual levels it is highly appriciable, when we understand them from that particular time point. Yes, this is a SPOILER comment! Amrapali this DVD is available with SHEMAROO or Moser/ you may browse the respective web sites. It is worth for the songs of Mohd Rafi and Asha Bosle. biswajeet ,he is still in people’s heart, he did good to make a long time memory for indian people. I need to see this film desperately .The songs keep coming back to me and I have them saved as my favourites . It is on the youtube. Copy & Paste this link in your browser or just search for the movie on youtube. I have searched the net but ….!! Try Atul’s blog (link in my sidebar–Atul’s Song A Day)…he has posted thousands of song lyrics and is very witty in addition :) Plus—he takes requests!!! It seems to be an excellent movie .Biswajeet in particular was an expert in similar mystry movies like Bees Saal Baad and Kohraa. Can any body tell me where I can find a CD of this flim? Really a travesty of Hindu culture.These incidents do not appear in real life. wher are these movies gone ? please bring them into market today we are hungry for these movies. our heart throbs handsome, and perfect actor Biswajeet and beautiful Mumtaz and Sharmila Tagore wow i love them all. Please bring back those days. Like Ram Aur Shaam (1967) being a predecessor to Seeta Aur Geeta (1972), this movie sounds like a predecessor to Neel Kamal (1968). 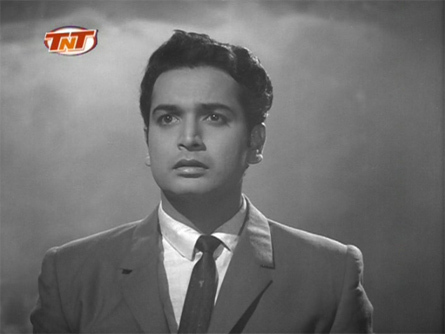 Biswajit is replaced by Waheeda Rehman and Sharmila Tagore and Mumtaz are replaced by Raaj Kumar and Manoj Kumar respectively. Not to take anything away from the review, but just adding my 2 cents here. Yeh Raat Phir Na Aayegi is a brilliant suspense-thriller with outstanding music composed by O.P. Nayyar consisting of memorable songs in the enchanting voices of Asha and Rafi. 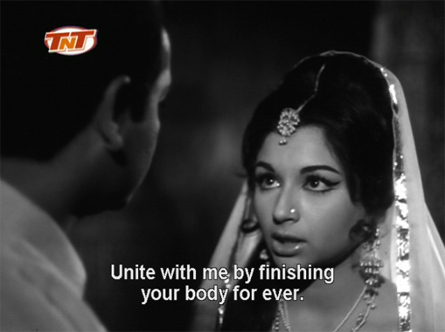 Though I could not digest Mumtaz’s negative character as revealed in the climax because there were no such hints and the explanation was not convincing on the part of her character. However, overall this movie is very good.